It’s that time of year again, the air has a crispiness to it that only means one thing: Fall is around the corner. 9/11 is a date that is etched in our collective memories. We’ve all seen the images, we’ve all heard the theories, and we all share the same hope of ‘never again’. The date also brings excitement for the North American gamers among us: EA sports releases it’s new NHL game! 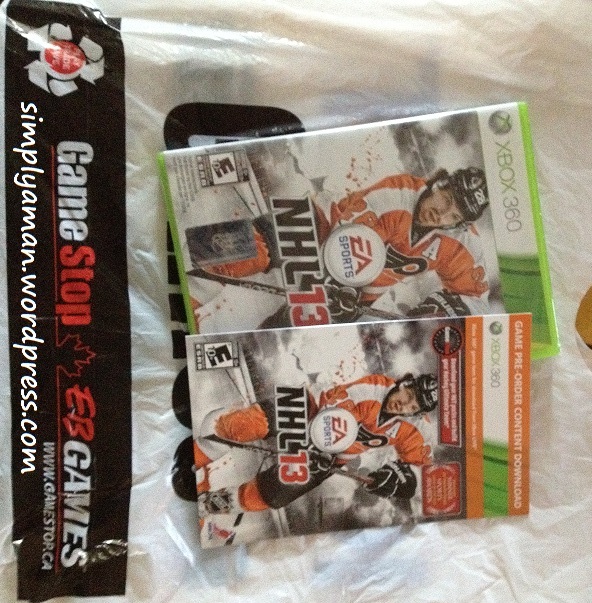 When I woke up this morning I was itching to get to Gamestop/EBgames to pick up my pre-ordered copy of NHL 13. I was in for a surprise when I got there! The last few days I had gone through a number of my games and selected those who I would no longer play or had all achievements on and decided to take them in as trade ins. For a total of $53.43. Apparently because I was trading in my games towards the purchase of NHL 13 I received a 20% trade in bonus! I was shocked and ecstatic! Since I already had put $5 down on a pre-order my final bill became: $2.80 + $3 gameplay warranty for a whopping total of $5.80! Gather up those old dusty games you no longer play and run to Gamestop to pick up your NHL 13 copy for pocket change!